An air dryer is an essential component of an air compressor used in an industry that requires a high level of air purity. From specialized compressors used in dental offices, to power precision pneumatic tools, to industrial compressors running equipment in a food processing plant; there are many industries in which an air dryer helps to prevent contamination and infection. 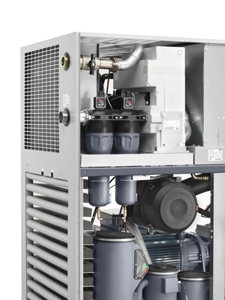 A compressor air dryer helps to keep contaminated water molecules out of the compressor’s air output. It also assists in eliminating unnecessary particulates by preventing corrosion within the compressor’s pipes. This reduction in mist and airborne particles helps to reduce the strain on your compressor’s filters and allows the entire system to operate more efficiently while providing specialized air. Our air dryers come from some of the top manufacturers in the industry, like Atlas Copco, so when you buy an air dryer from us, you can rest assured that your dryer is well built and will reliably provide the dry, clean air you need for even the most exacting applications. Let our team, which has nearly 30 years of experience in the compressed air industry, assist you in finding the right dryers for your medical, electronics, or food processing needs. Call or email us today to find out more about our selection of air dryers.